Below is our selection of 150mm (5 7/8 inch) stroke linear actuators. We offer a 150mm stroke only in our powerful P16 product line. The 150mm P16 actuator is available with an "S" or "P" control option. 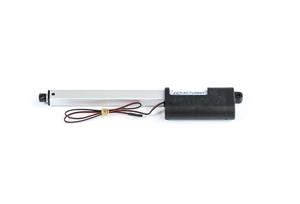 "S" series linear actuators are controlled via reversing polarity on the device's 2 wires. "P" series actuators feature position feedback and are designed for use with our linear actuator control board. This board allows you to adjust speed, stroke end-limits and sensitivity. If you need help choosing the correct actuator for your application, please contact our sales team.